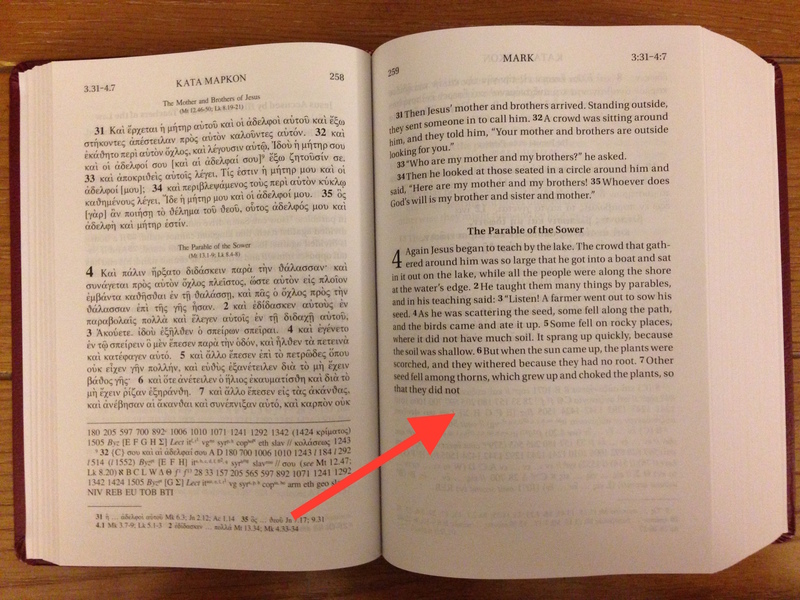 Yes, I’m aware that it’s probably better to practice Greek reading with a Reader’s Bible (N.T. Wright even told me that!) than with a Greek-English diglot. 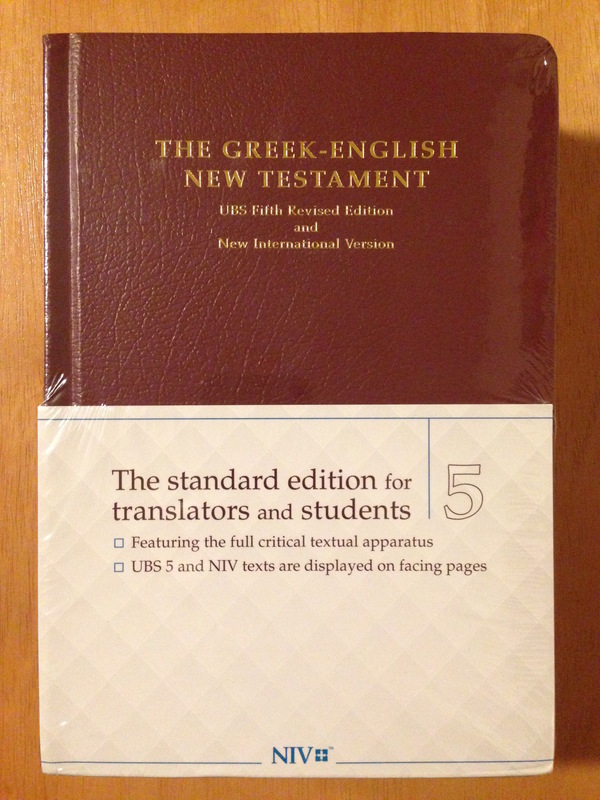 That said, Zondervan’s new NIV11-UBS5 diglot is an excellent Greek Bible to have on hand and use for both reading and research. To each their own, I guess, but I still haven’t gotten used to it, even after reading through full chapters of text. But everything else (layout, font, book construction, feel, etc.) is spot on. 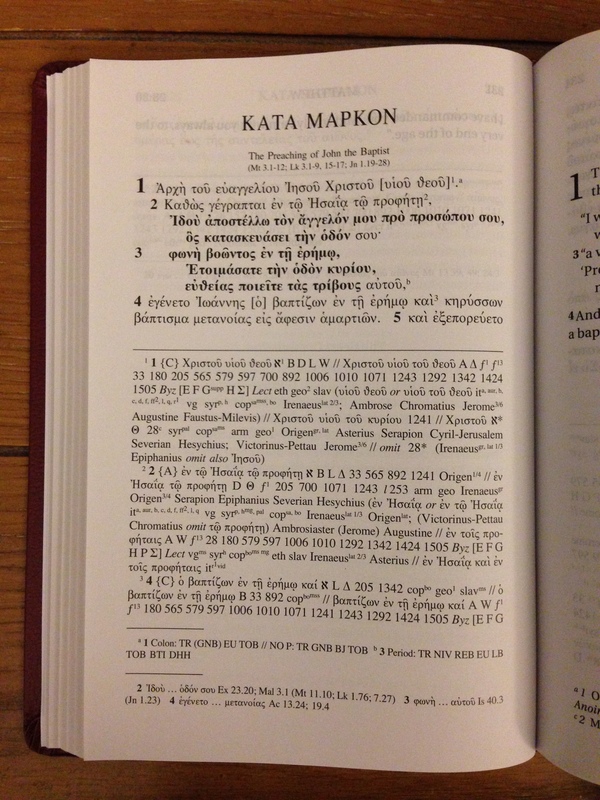 I’m a fan of this Bible, and while I’m pushing myself to use a Reader’s edition (Greek only), when I want English and Greek side-by-side, this is my new go-to. You can learn more at the Bible’s product page here. It’s on sale at Amazon here. Thanks to Zondervan for the copy, provided to me as part of a series of ongoing posts about the 2011 NIV–though there was no expectation as to the content of my review. 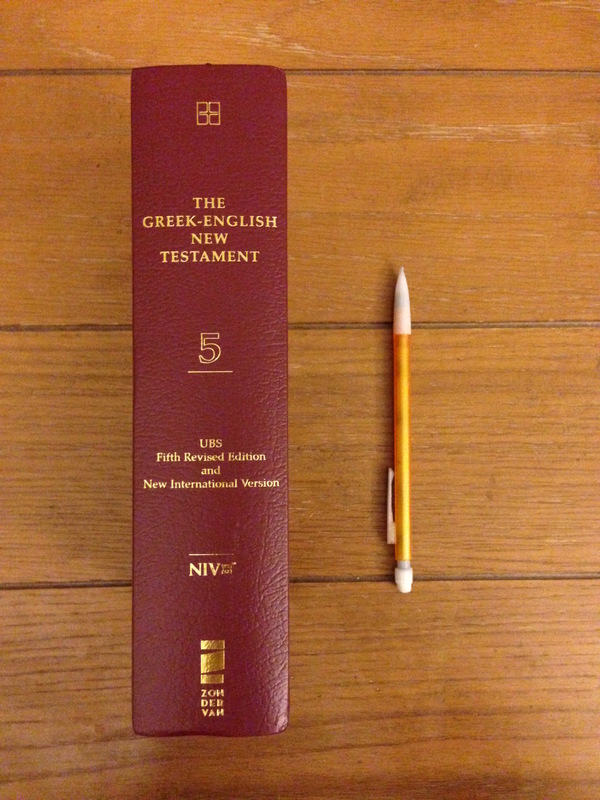 Everything looks great but putting the NIV next to the Greek doesn’t make it an accurate or useful translation. No one should ever formulate a Biblical position or base their understanding of God’s word on the NIV. UBS5 is good and the format sounds well thought out. I just wish they had used a quality translation. Thanks for checking out the blog. Not knowing you, I don’t know what your objections to the NIV are. I, for one, wish (as I say in my hyperlinked post re: NIV11) that “mankind” had given way to the more accurate “humankind,” which is surely what the Bible has in mind when it speaks of humanity. That said, I disagree with your assessment. Where specifically do you find discrepancies between the Hebrew/Greek and the NIV? Obviously no translation is perfect (translation by definition is not one-to-one), but I think we’d have to have a lot of evidence and original language knowledge ourselves before we could make a good case against a translation team that is leading scholars from the field. The product info says it’s ‘Flexicover’. How flexible is it? Is it like a soft leather cover or a bit stiffer? Also, is it sewn binding? Hi, Graham–you’re welcome! The cover is somewhere between soft leather and hardback. It’s harder than a truly leather cover. To the touch it feels flimsier than you’d like, but it has held up well all the same. Yes, binding is sewn.